Well the manufacturer's spec sheet states that the sub is best suited to a sealed box. So that being said, you don't have many variables to play around with that will seriously effect the sound. Just make sure it's a well built box with lots of bracing. Here's an online calculator for boxes that automagically finds the flattest response patterns for a given driver. http://www.linearteam.dk/default.aspx?pageid=newdriver They recommend a sealed box of 100L, wereas the manufacturers say 30, 40, or 50L. I graphed all four options and they're very similar. I also took a look at possible ported options. You can either get a 30L box with a 25Hz tuning to look very similar to (but louder than and not as flat as) a sealed 30L, or you can get a flat response at 195L tuned around 22Hz. I think you don't have that kind of space to play with, so best stick to the sealed. 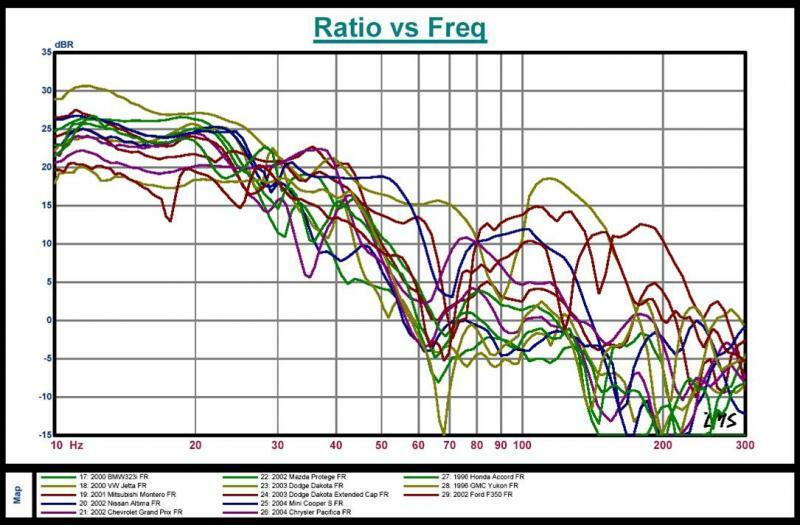 When looking at these response charts keep in mind that cabin gain is NOT factored in as every car/truck/van has a differing cabin gain response that is roughly a 12db/octave rise in bass response below ~80Hz - this will flatten a sealed box's response back out to a nice flat line. So go sealed, I'd say 50L. As for box building, put lots of braces into the box, and stuff your sealed box with poly-fil or a similar acoustic box stuffing agent to help slow down the air in the box (this helps make a smaller box respond like a larger box at a rate that's dependent on how heavily stuffed the box is). Hope that helps. Please explain why you believe this is desireable. Personally, I believe a final response that rises steadily from 80hz down is preferable as it counters the natural rolloff in response our ears have. The hearing rolloff you speak of only really happens at lower volume levels. As volume increases our hearing flattens out and the rolloff becomes non-existant or lower and lower. A typical car has a city traffic noise floor of ~85db so I assume that in this environment one listens to music at ~89-93db depending on preference. You'll notice that on this famous graph of hearing response, at 90db the rolloff is less than 3db/octave below 80Hz, and flattens out from there as the volume goes up. The gain is much steeper than even the 85db listening level's rolloff. At 12db/octave a serious gain in bass response is expected in the average vehicle. If we subtract out the 3db/octave rolloff from our hearing, that's still 9db/octave of boost that the car's interior will give to your subwoofer's response. You'll hear time and time again from the SQ gurus in car audio that sealed boxes are simply the best way to go because of this friendly cabin gain relationship (not to even begin on issues of a vented enclosure behaving strangely below 70-90Hz, depending on the car, as the wavelengths pressurize and rarefract the space rather than ommitting waves of pressurized and rarefracted air). Besides, his/her sub is designed for a sealed enclosure and a 195L vented box seems a little silly. Typically, you would want to move your box around in the trunk to see which placement works and sound best to you. Okay, I'll slow right down to the beginning (I know I sort of flew off into tech talk there - sorry). Make a sealed box. That's goal #1. Make sure it's sealed off. Get the seams perfectly square (unless your box isn't designed to be square) so that they stay sealed together the whole way along. Make it look nice with any sort of finish you want. Paint is easy, try textured truck bed liner spray paint - that will make it look a little more factory. Carpeting is a bit trickier, but still not too hard - drive to a fabric store and get some cute girl working there to look at your trunk and match the fabric to look as stock as possible - staple it in place with a staple gun. Mirror finishes, plexi-glass with LED bling, and curved fiberglass moulded enclosures are all what I would consider 'advanced' finishing. A moulded fiberglass box isn't the hardest thing to accomplish, but getting it perfect is. When you build the box make sure that there are a couple extra pieces of wood bracing the sides of the box to one another to prevent excess box wobble. Also, since you'll be probably leaning toward building a smaller enclosure go to your local craft store and buy some poly-fil and fill your box with that - it will make your box sound like a bigger box (a good thing in your case). IKEA also sells some cheap poly-fil pillows that will work too. Other materials will work if you can't find poly-fil, but it's the safe bet. Take a look at pics around the web to try to get ideas on what will work for your trunk and your style (that's a big factor as it's you that needs to be proud of it). If you find a few examples and are still stumped we can prolly help then. Good luck, and share a pic with us when you're done. Hey man where you at? Are you on any of the 300 or LX forums? I have a 300LTD (yes I know too cheap to get the Hemi) LOL I will be starting my install tomorrow. If you are around Brampton hit me up and we can grab a coffee and compare notes.